Cats were very important to the ancient Egyptians and were even considered to be demi-deities. Not only did they protect the crops and slow the spread of disease by killing rodents, they were also thought to be the physical form of the goddess Bastet. Bastet was the goddess of protection, pleasure, and the bringer of good health. She had the head of a cat and a slender female body. Bastet was the daughter of Ra, sister of Sekhmet, the wife of Ptah, and the mother of Mihos. 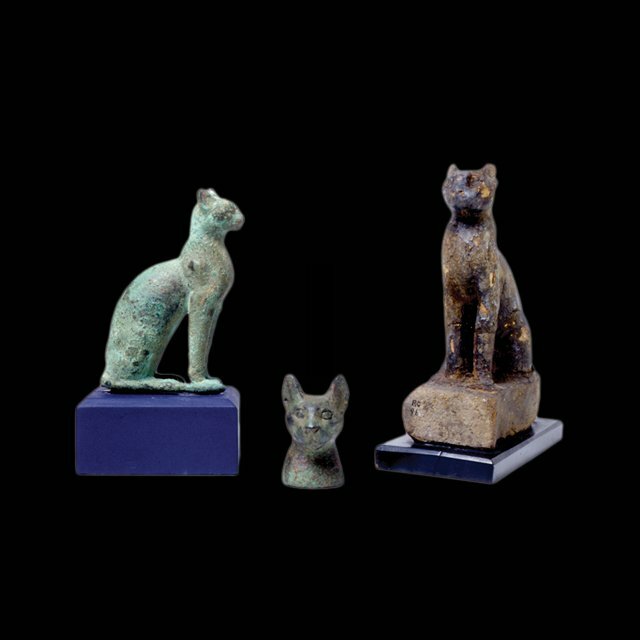 Since the Second Dynasty, Bastet was worshiped as a deity, most commonly in Lower Egypt. Her form and powers changed over the years. It was believed that every day she would ride through the sky with her father, the sun god Ra. As his boat pulled the sun through the sky she would watch over and protect him. At night, she would turn into a cat to protect Ra from his greatest enemy, the serpent Apep. Due to her protective duties, she was nicknamed the Lady of the East, Goddess of the Rising Sun, and the Sacred and All Seeing Eye. She is also known as the Goddess of the Moon and was thought to be the eye of the moon and the eye of Ra. Bastet is still worshipped today and her protection is believed by some to be cast over modern cats.